At Airedale Springs, we know just how important our team is. Over the years, we have been lucky enough to work with generations of the same family, sometimes for 20, 30, 40 and even 50 years! As we have seen these generations come and go, we have been able to identify just how important future generations are. Now that we are in the Year of Engineering, we thought that this would be the perfect time to discuss the importance of apprenticeships. We have had the pleasure of working with some incredibly talented and hard-working young people through our apprenticeship programme, so we see how important it is for them to be given the opportunity to begin their career. While school, college and university offer one route into engineering and manufacturing, this is often not suitable for everyone. This is where apprenticeships can be particularly valuable as they allow those who may not perform as well in a traditional educational setting to develop their skills and learn their trade. While traditional education methods can do a fantastic job of equipping young engineers, apprenticeships are able to deliver a great education that can meet the needs of young people who may perform better in this environment. On-the-job training can bring a whole new level of understanding for a student as they are able to see what they are learning in action. This makes for a great way to train the future generation of engineers who are able to get hands-on experience that they may otherwise not get until they are in the world of work. Having new blood in a company can offer plenty of benefits, such as the opportunity for new and creative ideas. Having a diverse workforce can be a great way of encouraging innovation and apprenticeships allow for younger minds to be brought into the team. Apprenticeships don’t just offer an educational opportunity for the apprentices but for other members of your team also. This is a great chance for everyone to hone their skills as they help to train your new apprentices. They can be reaffirming their knowledge of their job and the processes they use as well as learning how to lead and mentor inexperienced members of staff. What are the Career Prospects for Manufacturing and Engineering Apprentices? 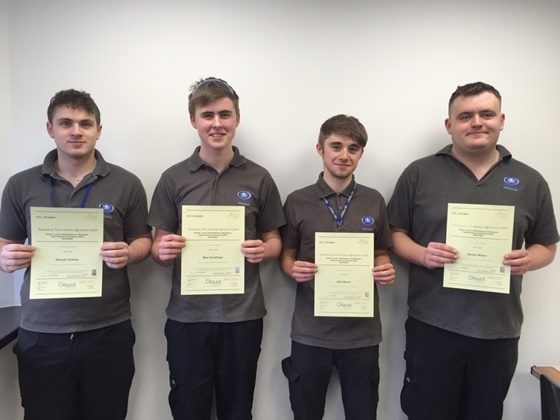 We believe that apprenticeships are extremely important, so we are invested in delivering excellent apprenticeship programmes that not only benefit the individual but the company as well. As expert spring manufacturers, we take great pride in ensuring that we are doing our part to address the skills gap within the sector. If you would like to find out more about our apprenticeship programme, don’t hesitate to get in touch with a member of our team by calling 01535 643456 or by emailing us at sales@airedalesprings.co.uk and we will be in touch.